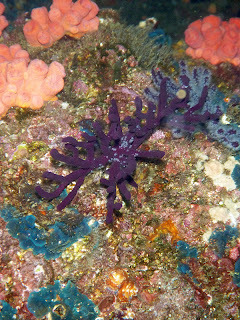 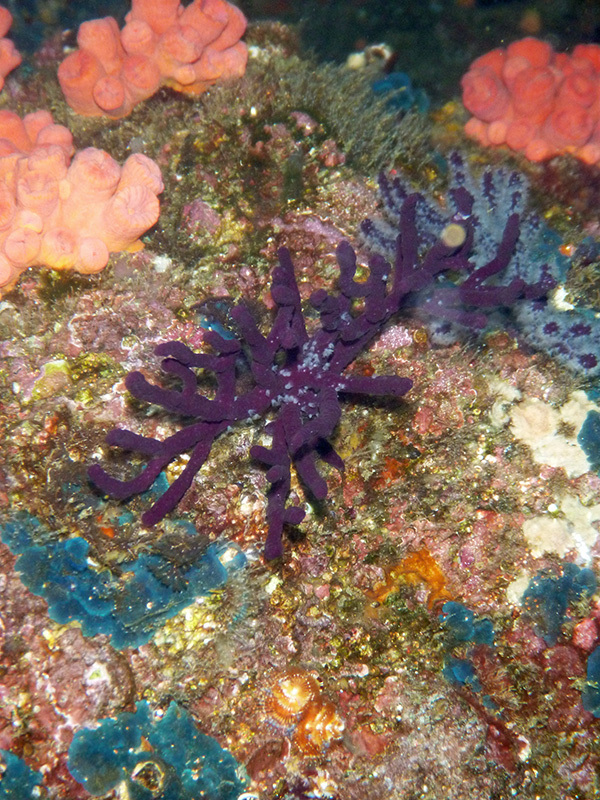 We actually visited Cardoncito Reef via the dinghy while still anchored at El Mezteno on Isla Espiritu Santos. However, the reef is located at the entrance to Caleta Partida at the southernmost corner of Isla Partida. 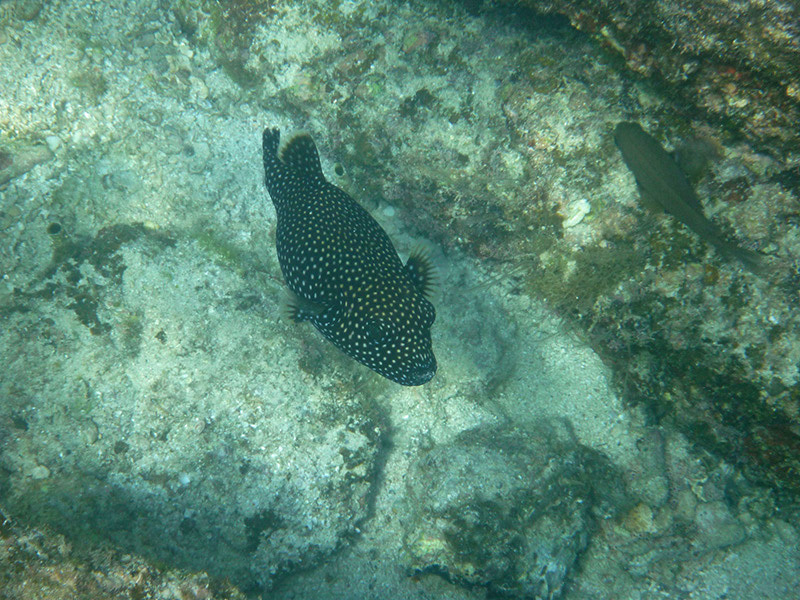 Patrick found the water too chilly to go snorkeling, so I was alone amongst the myriad fish swimming through shafts of sunlight penetrating a blue-green sea. I find it miraculous that simply by donning fins, a mask, and a snorkel, I can become a fish by extension and enter into the piscean world. 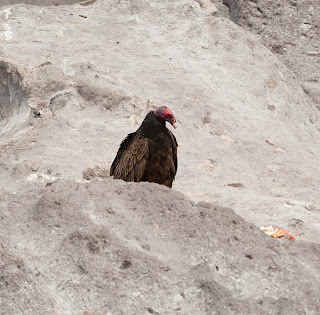 I consider it a rare privilege to be able to observe animals going about their daily business in their natural surroundings. 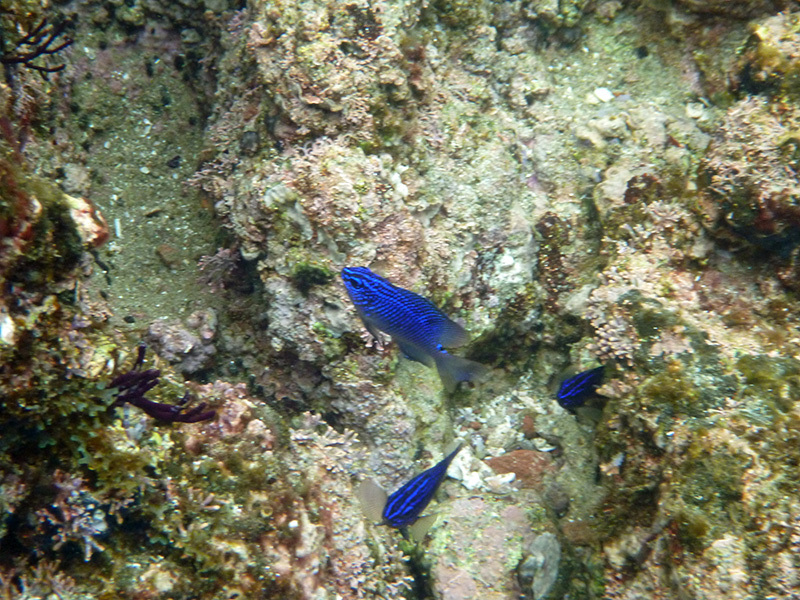 The visibility wasn't as clear at Cardoncito Reef as in Los Candeleros, but I was in deeper water, and there were different and larger fish species. 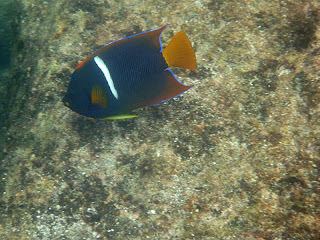 This video clip gives you an idea of what my experience swimming surrounded by sergeant majors and king angelfish was like. 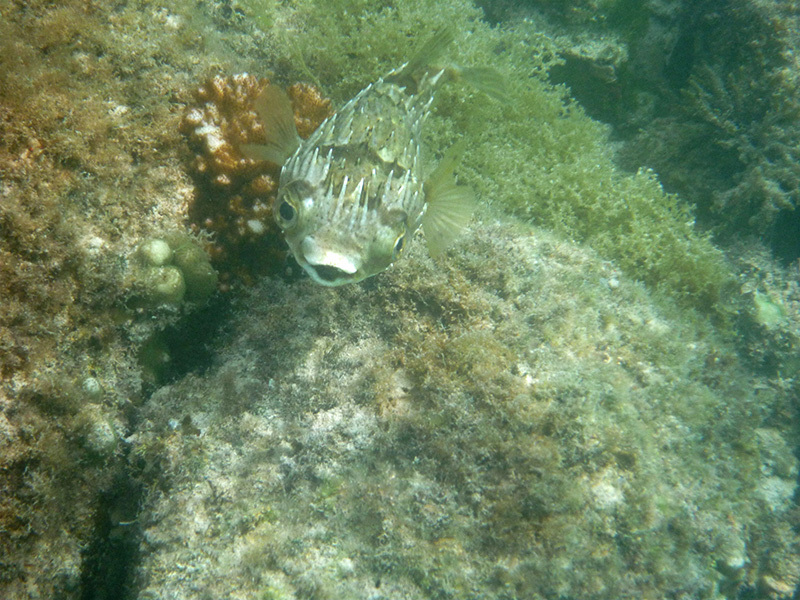 I don't know what the other large fish periodically flashing below me were. If you've snorkeled before, you will recognize the crackling noise in the background as popcorn shrimp. I also captured a picture of a true puffer fish this time. 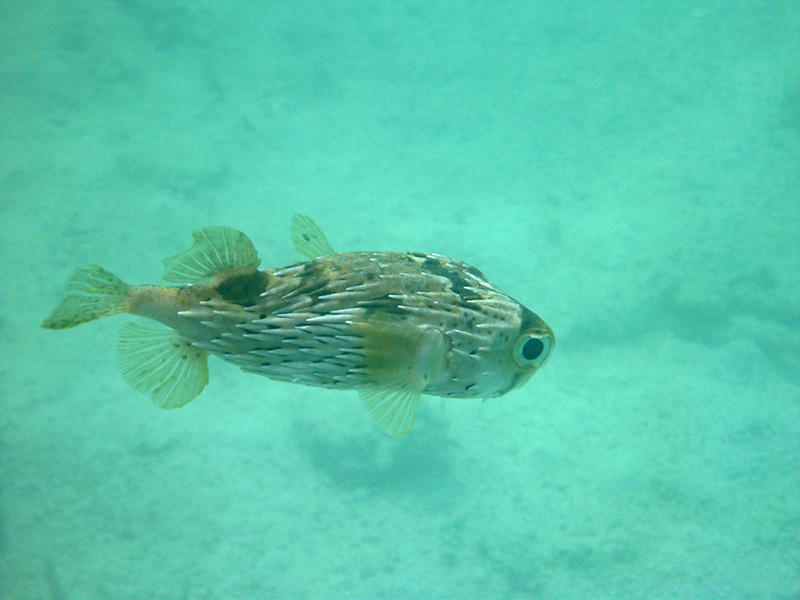 Puffers come in a variety of colors; this one was brown with white polka dots. 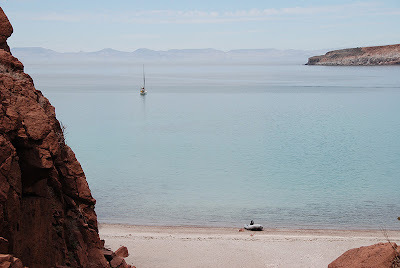 We took a dinghy trip to Las Cuevitas from our next anchorage in Ensenada Grande. We realized that in the calm conditions, it would have made a spectacular anchorage; but there was already a boat there, and we didn’t want to disturb their magic by moving in on them. 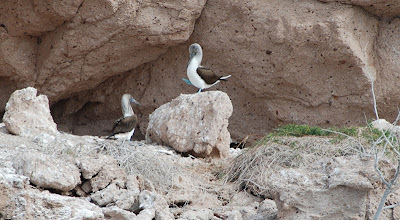 What makes Las Cuevitas such a special spot are the cliffs and caves rising straight up from the sea which house a blue-footed booby rookery. 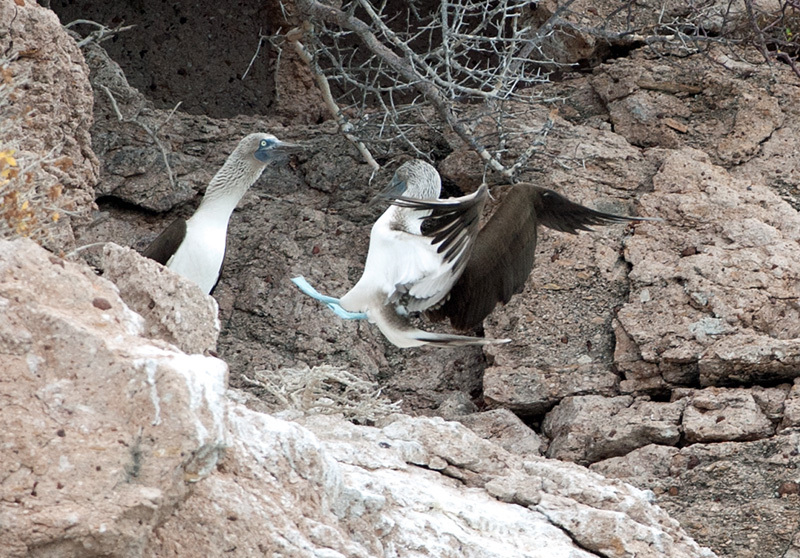 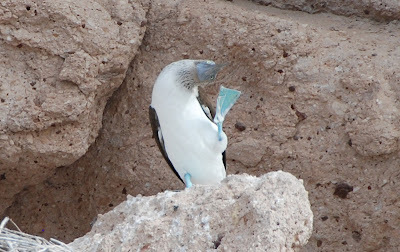 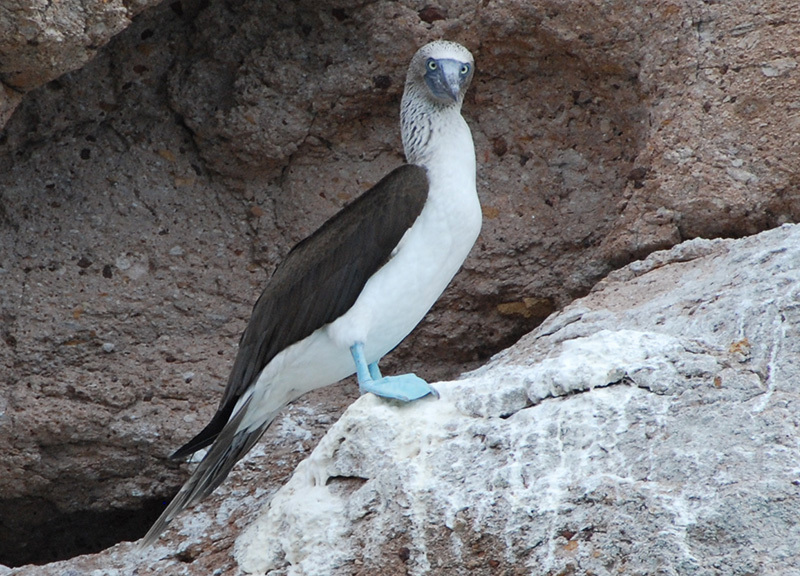 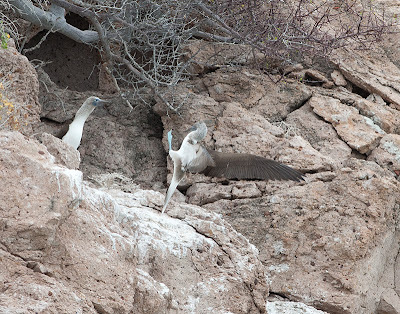 The wing display is then followed by the male booby lifting his blue feet one at a time and showing them to the female. For being such funny looking birds, boobies are graceful fliers. 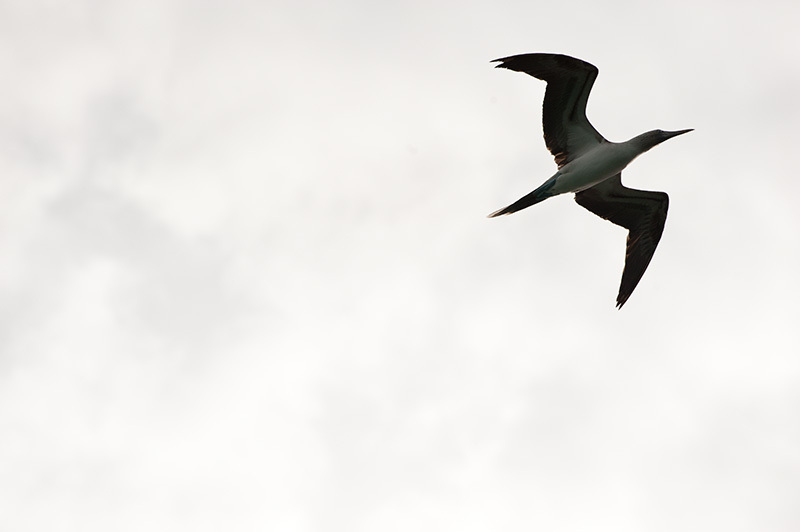 Patrick caught some of them on the wing. 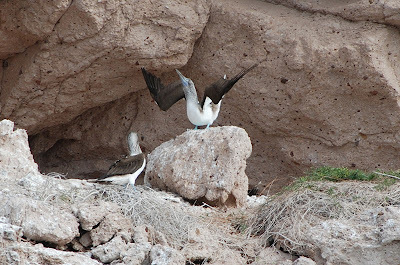 When landing, the boobies splay out their big blue feet, resuming their comical appearance. 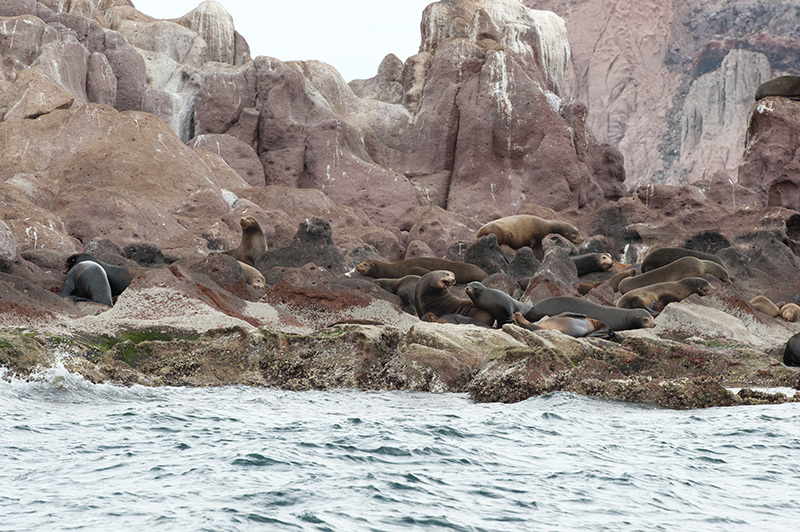 As an anchorage, Ensenada Grande wasn’t my favorite, because it housed a big tourist operation with tour boats coming and going all day. 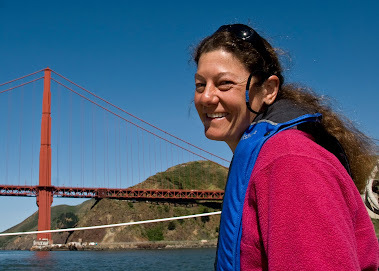 While we were there, a National Geographic eco-tour adventure boat also anchored and unloaded a flotilla of dinghies, ferrying kayaks and people back and forth from the beach (which itself was only a short paddle away.) 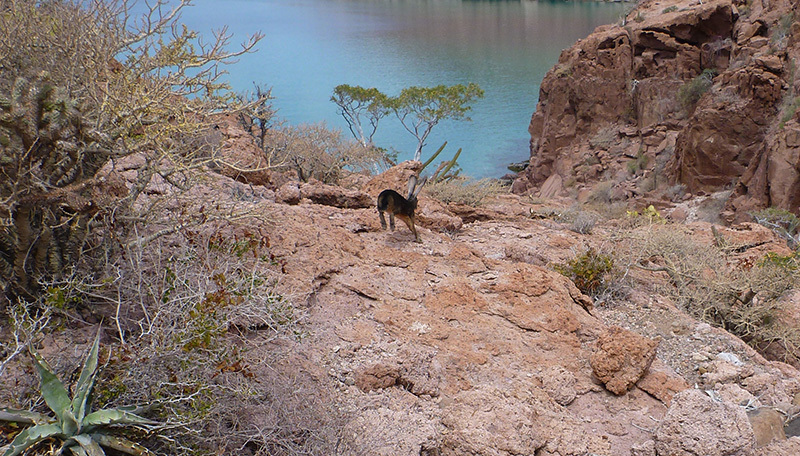 However, the anchorage is scenic with much to recommend it in terms of activities. 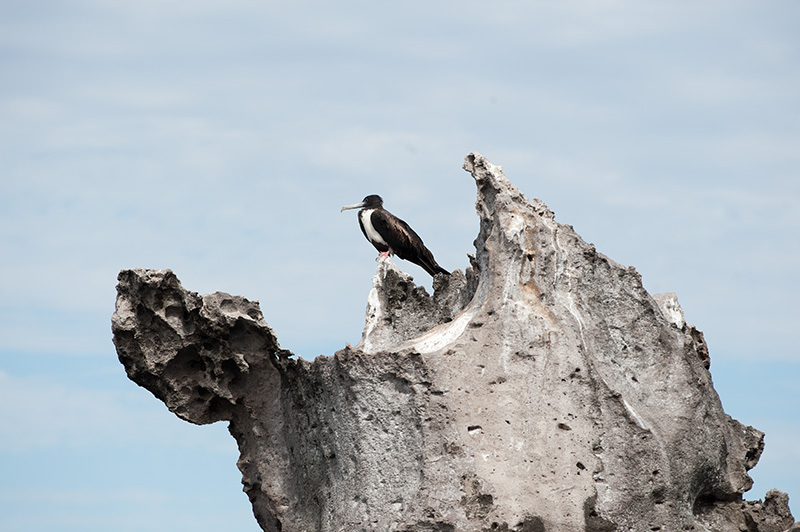 We took a side trip to Rocas Tintoreras (frigatebird rocks), where only a few frigatebirds were in evidence. However, the rocks were alive with all kinds of wildlife, and we also saw pelicans, cormorants, sea lions, and turkey vultures. It seems strange to see turkey vultures in the marine environment, but we have seen a lot of them on this trip. 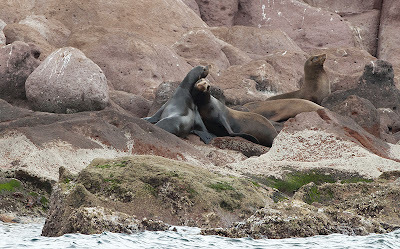 It makes sense when you consider the vast fish and marine mammal populations in the Sea of Cortez: There is obviously a huge source of carrion in the Sea. 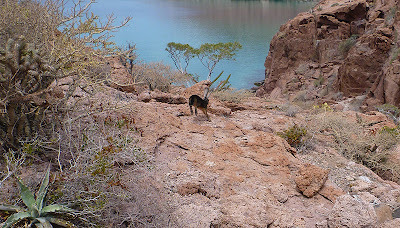 Back at Ensenada Grande, we took another hike up an arroyo for stunning views of the anchorage. 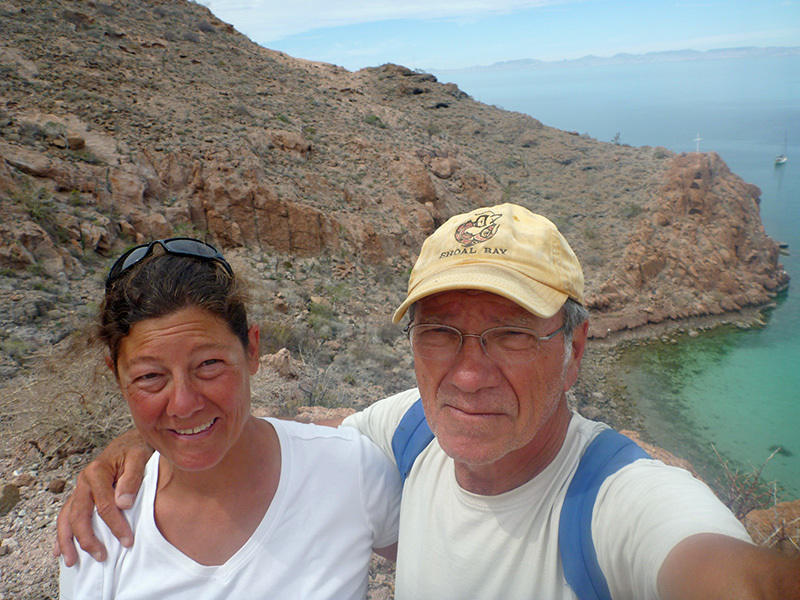 Here we are on a cliff overlooking Silhouette at anchor in the cove below. I took a look inside this cave and came face to face with the wide-eyed stare of a black hare. 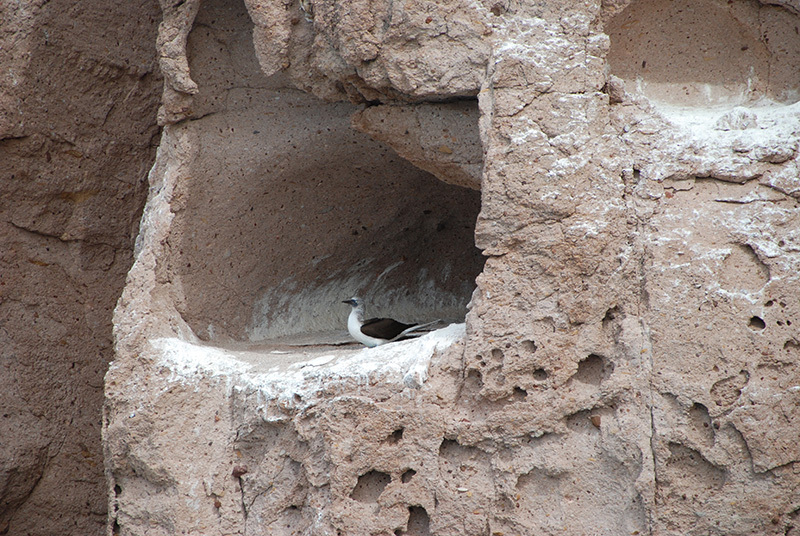 I ducked my head out and readied my camera for a photo, but I wasn’t quick enough. 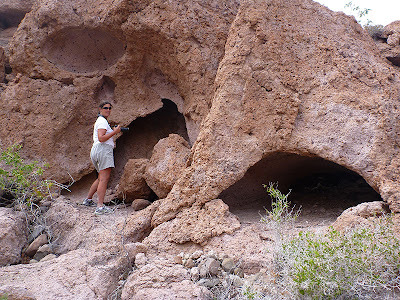 Patrick captured the hare as it exited out “the back door” of the connecting cave. 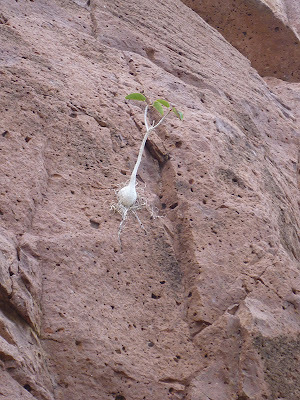 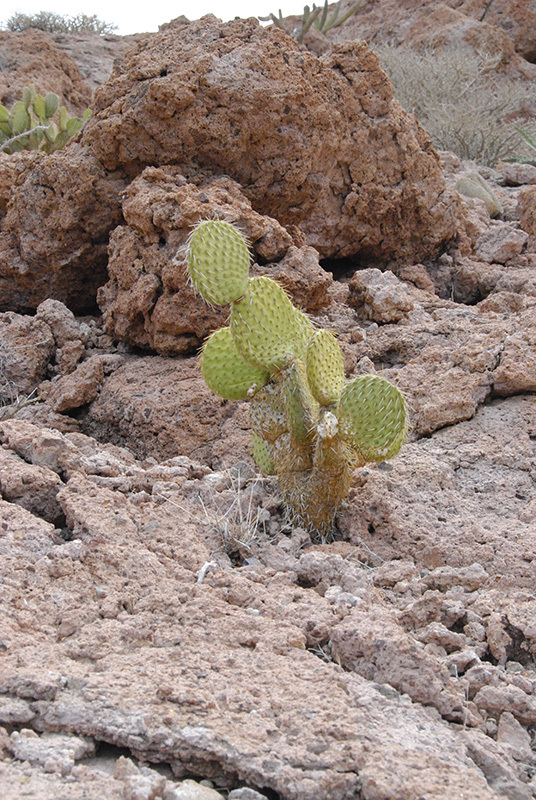 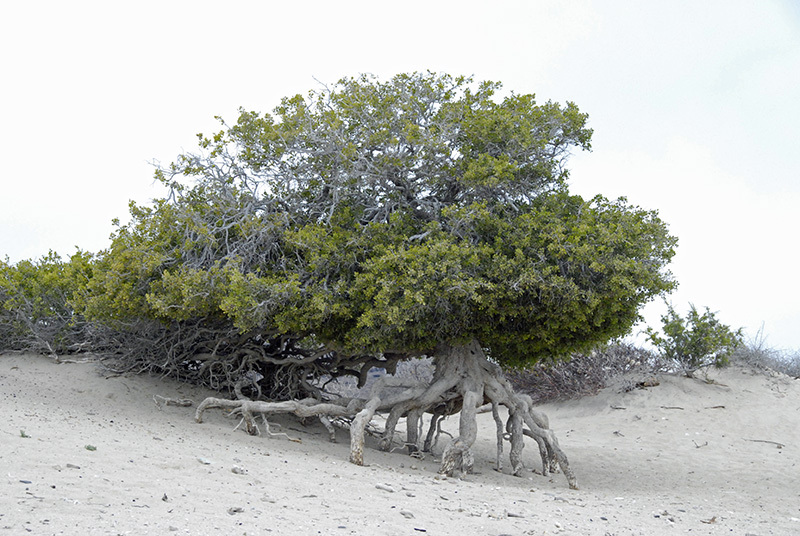 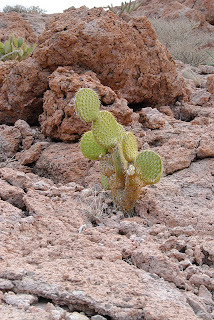 More improbable desert flora were spotted along the way. 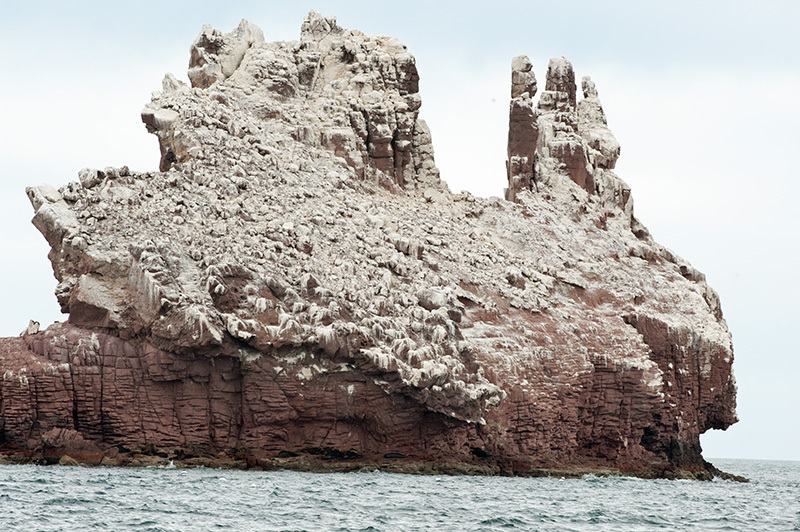 Ensenada Grande is also laced with reefs great for snorkeling. 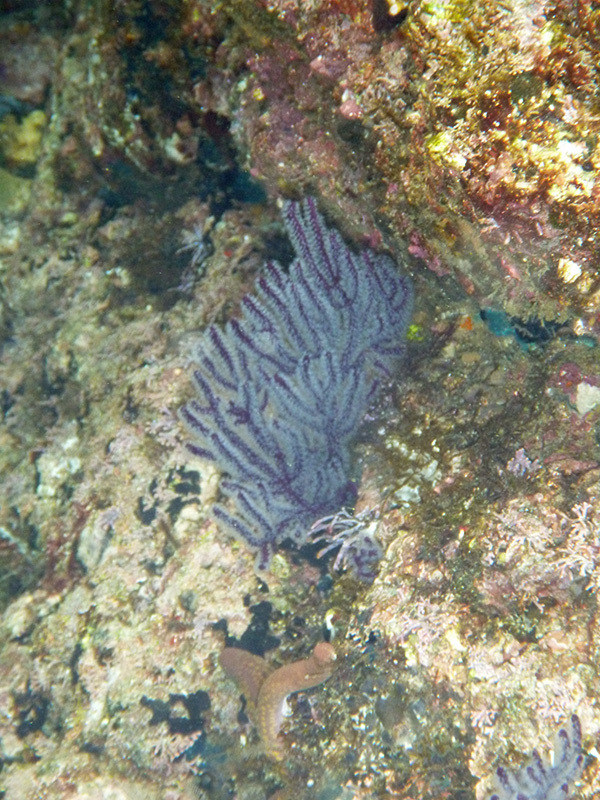 A deep reef housed big walls covered with coral and sponge gardens. 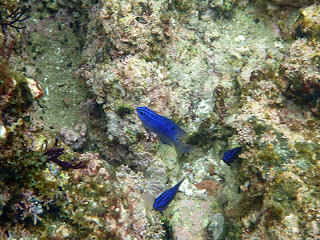 Numerous small fish darted out of every nook and cranny, feeding on the corals. 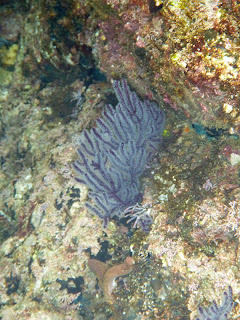 The shallow reefs also teemed with fish. Although we have seen porcupine fish in every location we have snorkeled, I got the best images of this fish in Ensenada Grande. 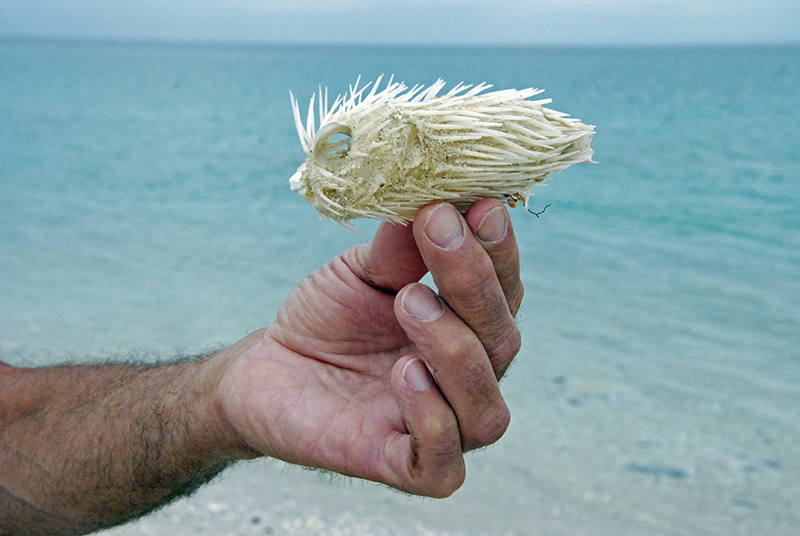 I can relate to the porcupine fish: prickly on the outside, but with a cheerful demeanor on the inside. 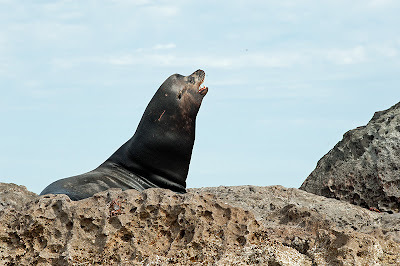 As we rounded the northern tip of Isla Partida, we paid a visit to the huge sea lion rookery on the rocky pillars and arch (not shown) known as Los Islotes. 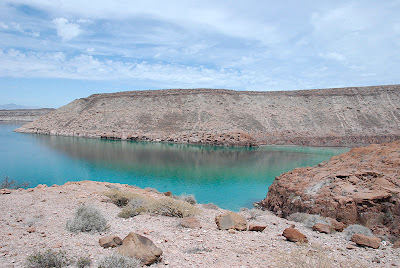 We had one more stop to make on the east side of Espiritu Santos before finishing our island sojourn: Playa Bonanza, the beach that had eluded us on our hike from Bahía San Gabriel. 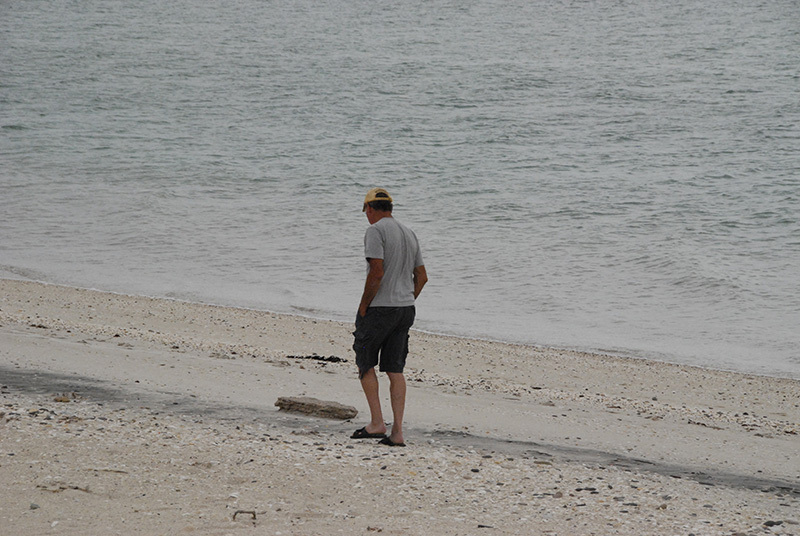 Alas, our weather window was closing due to an off-season cold front affecting the islands. The skies grew overcast and the temperature dropped a few degrees. At another time, this two-mile stretch of white sandy beach would have been the perfect beach for lounging in the sun and swimming in the crystalline turquoise water. 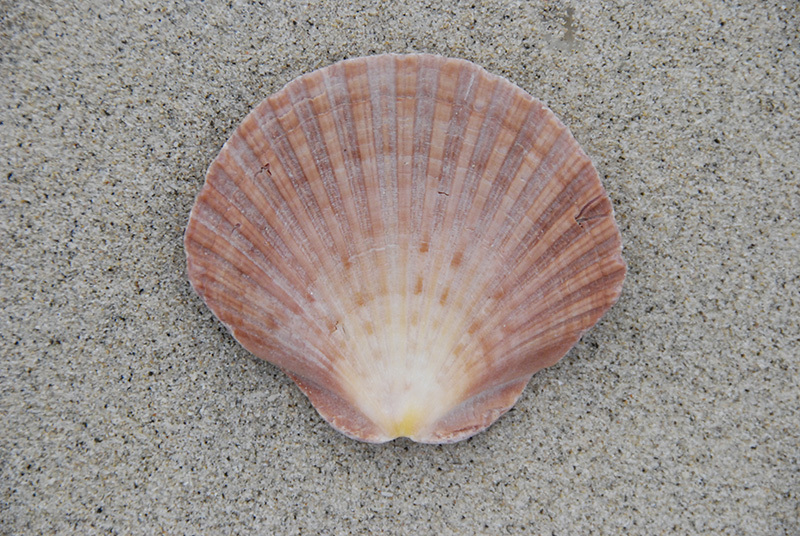 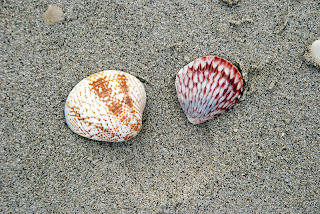 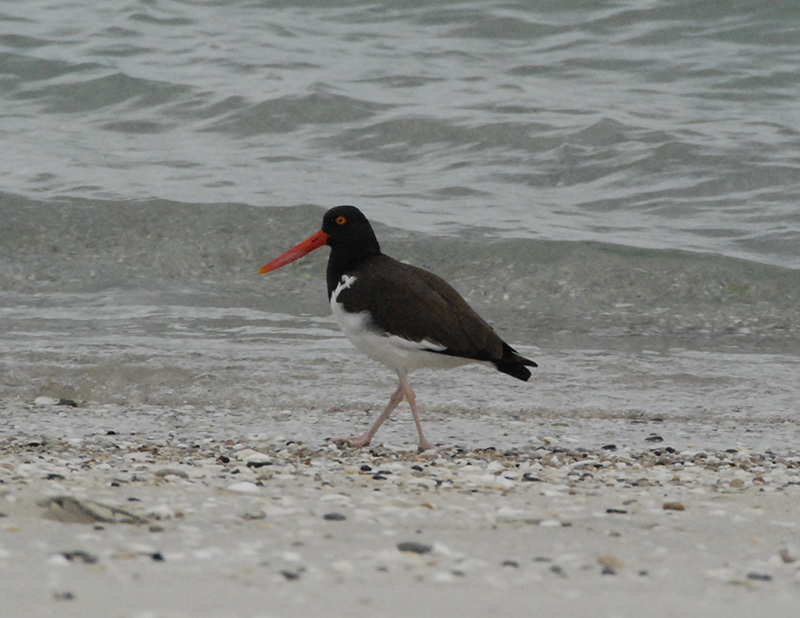 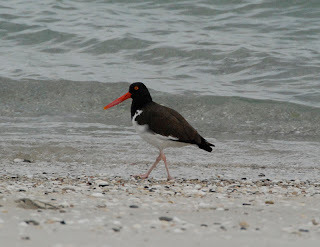 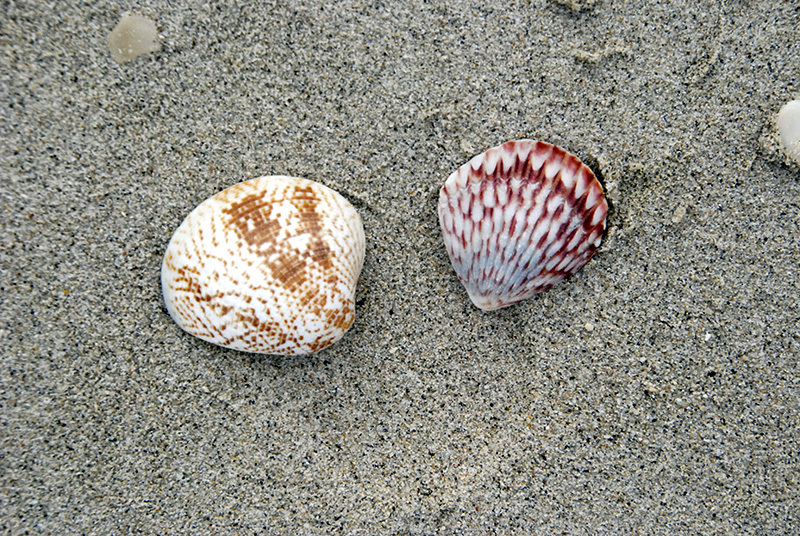 However, we enjoyed ourselves by taking a walk along the beach, listening to the soothing sounds of the waves lapping the sand, and collecting the shells which presented themselves in an infinite variety of colors and patterns. 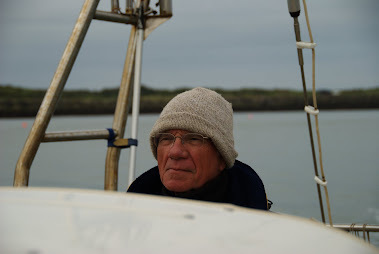 By that evening, we had 15-20 knot westerly winds in the anchorage, and I was sensing the sad, anti-climatic feeling of a wonderful vacation coming to a close. 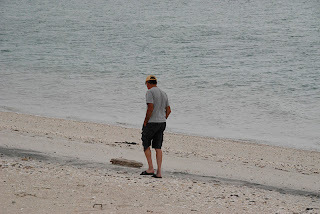 I felt like our journey was ending when, in truth, it was just beginning!